Nope. Many town road wooden decked bridges here. To lighten your dour anticipations, Andrew, don't forget embedded road grit. Or the fact that bridges are always level. And driveway speeds necessarily low, at least here. ps. Concrete and blacktop are slippery in snow. This is Vermont. Eight months of winter, and four months of damn poor sledding! 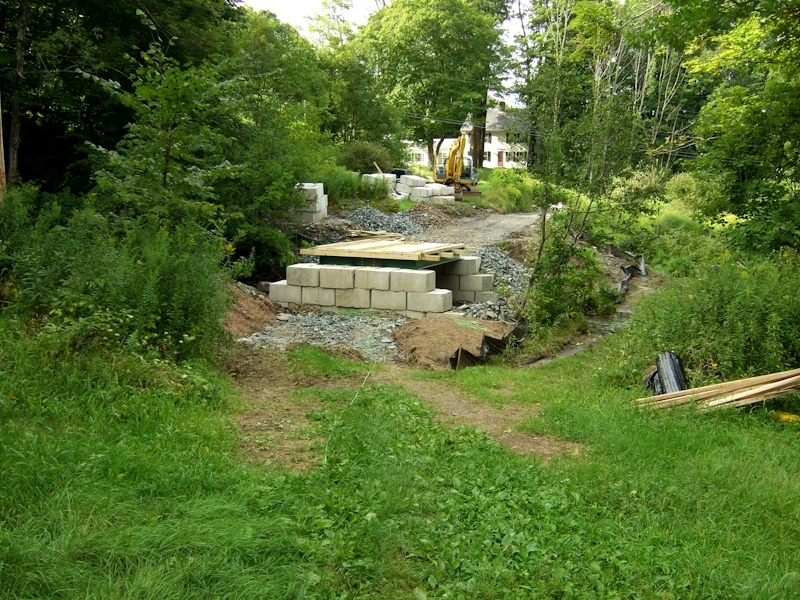 The 6 blocks left will be placed at either end of the bridge as abutments (mentioned above). Then gravel fill goes behind them. Steel beams are 12" tall, wooden deck is 5-1/2" tall, and runner strips are 3-1/2" tall (and 40" wide), total 21" tall. Beams are wide flange W12X26 meaning 12" tall, 26 lbs/ft weight. Fortuitously, they had mfr stickers on them when they arrived, and those showed ASTM A992 steel instead of the A-36 steel I thought they would be. That means they are stronger than I thought. A-36 is 36,000 psi yield. A992 is 50,000 psi yield. Steve, we have a wooden decked bridge crossing a small stream by our back door. It's ten foot wide and spans maybe twenty feet. Formed on a pair of heavy RSJ's that I had curved slightly (12 inch rise in the middle) for added strength and aesthetics. It's rated for four tons. 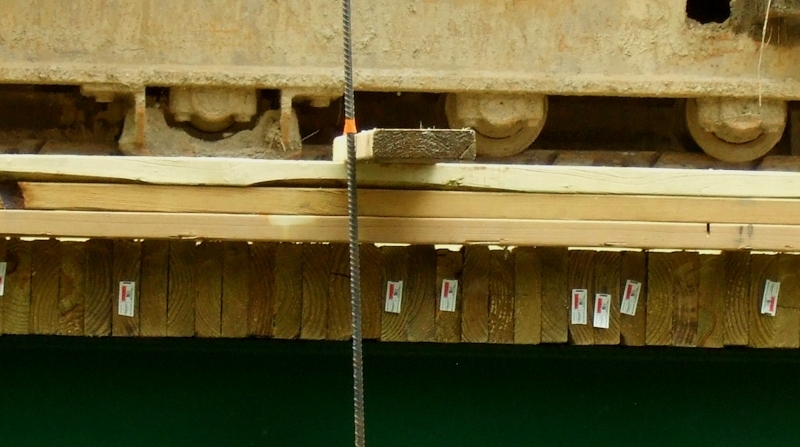 The deck is made from oak railway 'crossing sleepers' as ordinary sleepers (ties, USA speak?) weren't long enough. At certain times of the year you cannot walk over it without holding the hand rail, as even that slight arch has you skidding a over t .
It's probably a reflection on our different climates. External woodwork can suffer very badly from mosses and microscopic slimes. Here is a picture of it being decked out for my youngest daughters wedding, interrupted by the Emu incident ! Seen that in UK!. Beautiful pier or bridge covered with ugly metal net, after one person plunges into pond. Mosses and slimes would mean little or no vehicular traffic -- Yours seems to be a footbridge, I see flower vases on yours. and a 1 in 10 incline (1 foot at center, 20; long) is not a minor slope. No dirt road lead-ins to add grit. 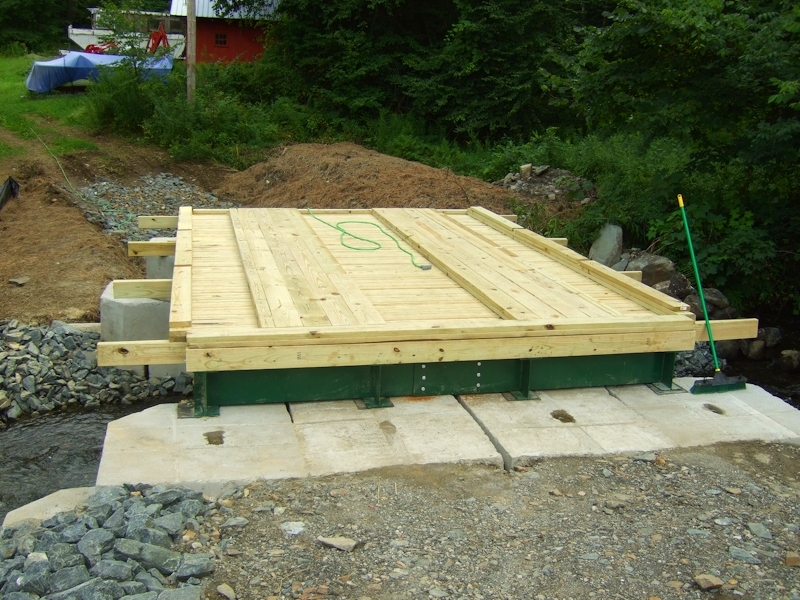 As I said there are many wooden surfaced town road bridges here in regular use. And our wooden covered bridges are famous. We have a large network of dirt roads here. I think problems may arise when people pave up to older wooden bridges. It may also be that the wood chosen has something to do with it. Softwoods absorb grit and fray differently than hardwoods. Anyway, tired of this kind of discussion with you, Andrew, like Rob, which is why I do wonder why I post projects at all sometimes. What piers or bridges would those be Pekka? as NONE of the six piers near me, nor have any of the wooden staithes, wooden queys have mesh on them NONE of which are slippy when wet! Nice job Steve , real engineering at home . I like the use of simple , but still costly materials , to do a major job . I would never have thought of using timber of that section but having thought it through it makes good sense , hope it last's for many years ! Nathan. I know there's a slippery pier somewhere in this area. On the Tyne I think - I'm just trying to remember where. I think I was fairly tired when I visited it so all i've got is a foggy memory of trying very hard to not lean too far and slip while also dodging the goose crap. Thanks guys I should have added earlier that it has rained practically every day here for a month during construction. the wood is totally non-skid under foot when wet -- which has been practically every day -- I've spent weeks working on it. That's actual user experience. And, the former footbridge which served us for eight years was not slippery at all when wet. And our porch and front steps are unpainted wood, and they've supported our family traffic for 18 years, without a single slip when wet. Unscraped ice and snow are another matter, but no, not from rain. Yucky slick toppings, like the aforementioned mold, slime, goose crap, banana peels, etc. are not the exclusive property of wood, but can coat any little used surface. The expression, a rolling stone gathers no moss applies here. 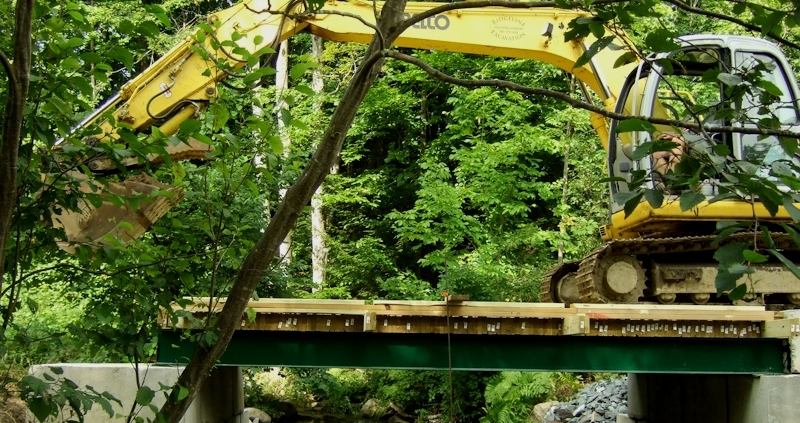 This bridge will see probably eight or more 5 mph vehicular crossings a day. It will have substantial railings. The wood is also preservative treated -- moss and slime don't favor it.. The lead-ins are bank run gravel, which tires will certainly track across the bridge runners. The bridge will be sanded in winter when there is ice, as will the entire driveway. Geese pass our property by for better grazing down the road. We compost banana peels. Should I post more progress pictures before I plummet off the thing? Yes, please continue Steve! I find all these real live matters highly interesting and educating. Keep them coming Steve ! If you do fall in please post a selfie!! More pics please Steve, i love this stuff. Curbs and runners added -- ready for end blocks and backfill. The south end will need a LOT of fill -- estimated at 8 truck loads. Nathan, if I fall I promise a selfie for sure, or an assisted one! Actually, a more realistic concern is for Dave the excavator operator who plans to put his machine in the middle of the bridge and backfill from there. He says he will have the trucks empty on the north side, and rotate it over to the south side. I think his excavator is close to 35,000 lb, or so. I'm not real keen on this operation, but he's confident about it. The bridge deck itself weighs in the neighborhood of 6,000 lbs. so 40,000 lb load. Technically a midspan point load of 80,000 lbs should come in under 66% of yield for four A992 W12x26 beams, but that's back of the envelope, and this operation does have me feeling concerned. He will be taking it slow, and I'll be watching for bridge deflection. It shouldn't be anything more than a quarter inch with that load, so if I see practically anything, I'm waving him back. Steve , that looks like a 15/18 tonne machine , if so , your math looks as good as usual ! 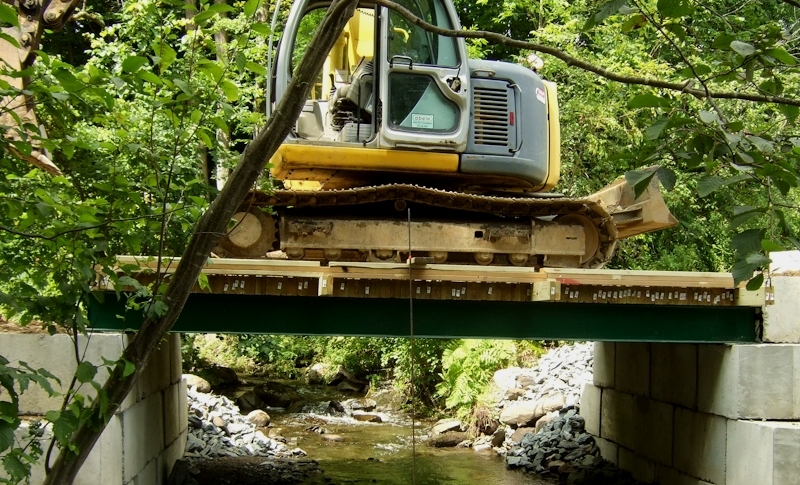 I've seen 21 tonne (PC210) and 35 tonne machines work on much more flimsy structures than your bridge . PC 350/450 were not uncommon in my previous employment working in very delicate situations, operator skills can make a problematic situation run of the mill. As always I'm enjoying your posts, I'd never realised the extent that you ( and others) would have to go to cope for future rainfall events. Keep the photo's and report going, I'm loving it !! Nathan. 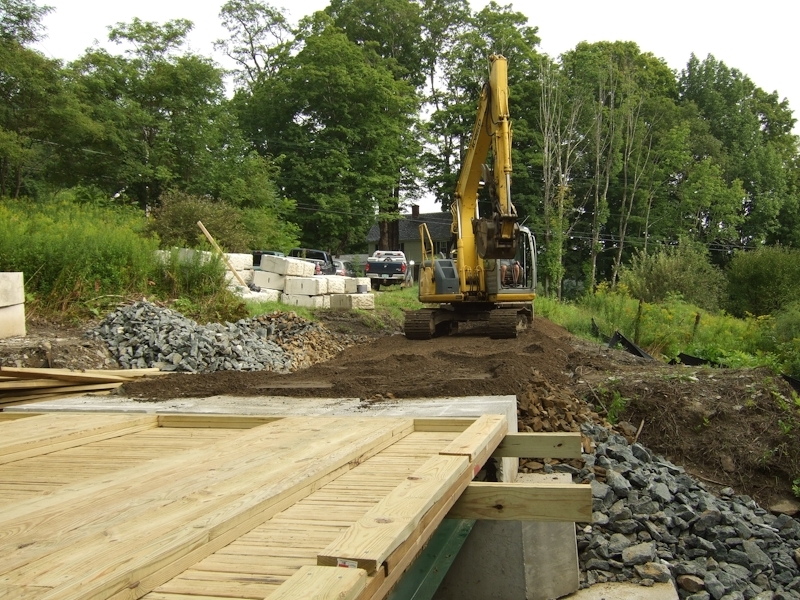 John and Nathan, re settlement -- of interest is that Dave first built coffer dams to enclose the stream, using the big crushed rock you see as rip-rap stone, then he excavated 2' below stream grade behind the dams and filled that excavated bed with smaller crushed stone. 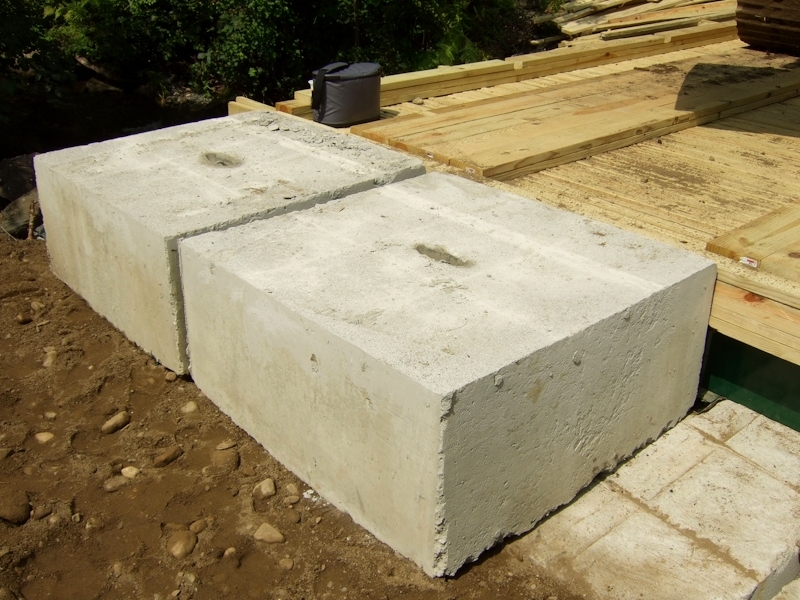 That's what the blocks were placed on. BTW the material removed was very bony anyway, so I think the foundation is really good. I'm sure there will be minor adjustment over time, but we have expansion joints naturally with the block construction, vs a solid poured abutment. Dave said he would be back-filling tomorrow starting at 8:00 sharp. He said he has decided to only put the excavator tracks a few feet onto the bridge from the north abutment, because he has enough reach, and then put a massive pile behind the south abutments -- built up much higher than them initially, because he can't tamp it down as well from as far away. Once it's big enough he'll cross. The dump truck will be dropping off to the south of him initially. The first step will be placing the 3 north end blocks against the bridge beams, then filling behind them, then venturing to his loading position. Fingers crossed, depending on how it goes, I might actually be able to drive my pickup truck across tomorrow evening. I know that you said Dave formed a track for the lorries initially, is there much to do to make the roadway, or is it close to your previous access road? The dump truck had a 14 yard capacity. It dropped off in front of Dave on the excavator after he had ventured a few feet onto the bridge. Dave would pick up a bucket load and swivel around across the bridge. He has a longer than stock dipper arm, and his excavator is heavier than stock for this size, as there is also a counterweight added to offset the longer arm. He also has a thumb and other additions. He says the weight is about 35,000 lbs. You can see the thumb here, as he is backfilling behind the lower blocks on the south side. Finally it was time to edge out onto the bridge. This went very slowly and carefully. I set a piece of 1/2" rebar into the stream as a vertical guide to check bridge deflection. A piece of orange tape marked the bridge resting position -- against a piece of wood that extended out. We dubbed the Bridge-O-Meter. 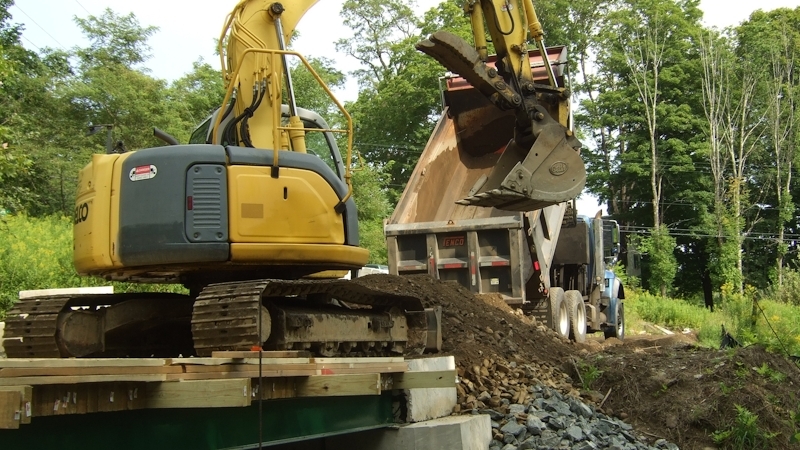 Amazingly (and gratifyingly) the Bridge-O-Meter barely registered his full excavators weight. We had maybe 1/16" deflection with the excavator sitting at mid span. It was hard to see at all. I had earlier calculated that a 40,000 point load, at center span, would deflect .25" on 4 beams of this section of A-992 steel. The excavator however isn't a point load -- tracks spread it out, and the 9" of solid wood does the same, as well as adding some stiffness, probably. So deflection was minimal. We were really glad to see this, and it meant we had confidence to bring the dump truck over. Heres the Bridge-O-Meter with Dave mid span. The deflection is not even visible. 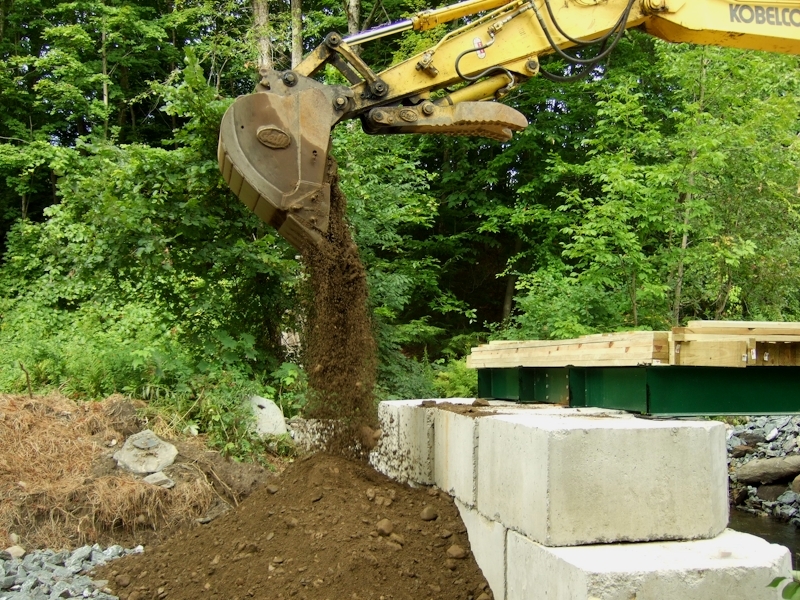 With the lower blocks sufficiently supported with back fill, it was time to place the north side's upper abutment blocks. Moving these 4800 lb units by driving the tracks, rather than by rotating did cause momentary deflections of up to 1/8" on the meter, but again, surprisingly little compared to our expectations. The greatest deflection I saw all day was one 1/4" bounce, when Dave was sitting mid span, and tamping down the gravel hard enough to lift the front tracks 6" with a fully extended arm, and then dropping back down.